In 1979, when times went slower and things were simpler, I paid more attention to that slow simplicity and cycled the wild atlantic way. It took me four months to do so but that didn’t matter. I was in less of a rush in those far off times and didn’t spare a thought for the worries that cross my mind nowadays. Worries like savings and pensions. (Forty years on and I am about to pay the price for breaking my years of service). As for the small bit of savings back then? well I continued to cycle until it ran out. This usually happened around five months and then I went back to work and started to save again until I had enough for the next time. In 1980 I repeated my journey. This time it took me a bit longer to complete for no other reason than that I had acquired a small wooden trailer. Hitched onto the back of my single speed black raleigh bicycle it was a clever contraption. It had Hinges at its four corners and a metal lip at the bottom of each side panel which meant the floor could be lifted in and out allowing the trailer to fold. The floor could then be used as a table. It was a wooden affair and heavy by today’s standards but I suspect we were of stronger body and mind back then (or maybe it was just because youth was on our side) and were blissfully unaware of the lighter and easier towable ones that would eventually come our way (along with lighter tents, mattresses that self inflated and clothes that folded down to the size of a euro coin) . I filled my new requirement not only with my tent and sleeping bag but also with a small blow up bed. Never before had I known such comfort while on the road. The Cooking Wok had just made it’s appearance into Dublin’s hardware shops around that time so I added one of them to my trailer and it proved a godsend, acting not only for cooking up stir fries( mostly from bits and pieces foraged from the sea and roadside) but also as a basin for washing clothes and for steeping seaweed in to make seaweed showers. As an added bonus the rounded base allowed it to sit happily down into a fire without tilting and spilling out its precious contents. Once at a festival I was waiting for a friend and knowing it could take a long time for him to find me (this was before mobile phones) I made a fire and started stir frying in my wok. A crowd gathered drawn by the smells of cumin and fenugreek( I think they mistook me for one of the Hari krishna gang who followed the festivals back then, cooking large amounts of brown rice and vegetarian meals for the festival goers in the hopes of a few converts). At last my friend found me but had to elbow his way through the disgruntled and hungry queue that was forming. ‘Easy! I just followed the smell of a good stir fry’ he replied when I commented on how quickly he had found me. Needless to say with all this extra paraphernalia I was slowed down but that didn’t worry me as things have a way of evening themselves out and by bringing such luxuries I was encouraged to stay longer on the road. My one regret is I did not have a camera. This basket was handy for all sorts of things, including wildlife. One day I spotted a small bird lying stunned in the ditch. (When cycling slowly you have time to spot such things). Though its eyes were closed I could feel its small heart beating and reluctant to leave it lying there for nature to take it’s course, I carefully made a bed with some toilet roll in my basket and laid it in it gently. Whether it was the wind through the gaps in the weave or the shuddering caused by the potholed road or possibly the fright of being taken away from its territory, I had only gone a half a kilometer when it recovered and flew off. I was saddened somewhat, romantically imagining having a pet bird as company on my journey. Envisaging it perched on the handlebars of my bike, singing contentedly as I whistled accompaniments and sailing through small villages to the delight of the local children. Ah well! I was happy too that it was of an independent by nature. And it was just one of the many happy moments as I pedalled along. Sometimes they were more of the human sort. I would be hailed by a family turning hay in a field. The woman, looking anxiously at the sky would enquire if I would help get the hay in before the weather broke. I might stay a few days helping with other chores. footing turf on a bog, helping to get the cattle to the local market on foot. If there was a handsome son I might be enticed to stay longer otherwise I would be on my way after a few days of being fed with spuds and cabbage. I also met up with friends at the festivals that happened to be in my path. Ballyshannon, Ballisodare, Lisdoonvarna. The fleadh in Ennis. I had company when I wanted it and solitary times when they suited me. Some days I covered many miles. Other days just a few. It was a magic time and I remember it as clearly as though it was yesterday. I have a bee in my bonnet and a vision in my head. The wild atlantic way is not the tarmacadamed car/bus/motorhome filled road it has recently become but a simple boreen walked or cycled by travellers. A spiritual journey for pilgrims who wish to connect with nature. The pilgrim’s destination being Skellig michael or Saint Finbarr’s oratory in Gougane barra or the Gallarus oratory on the dingle peninsula. And just as many travel beyond Santiago to Finisterre, those who wished could keep going to cape clear island itself. With small cheap hostels to spend the night enroute and where the traveller could get a decent meal and a good glass or two of wine. Where the laneways would be pollution free and the sounds of the wind and sea were not drowned out by the noise of traffic. 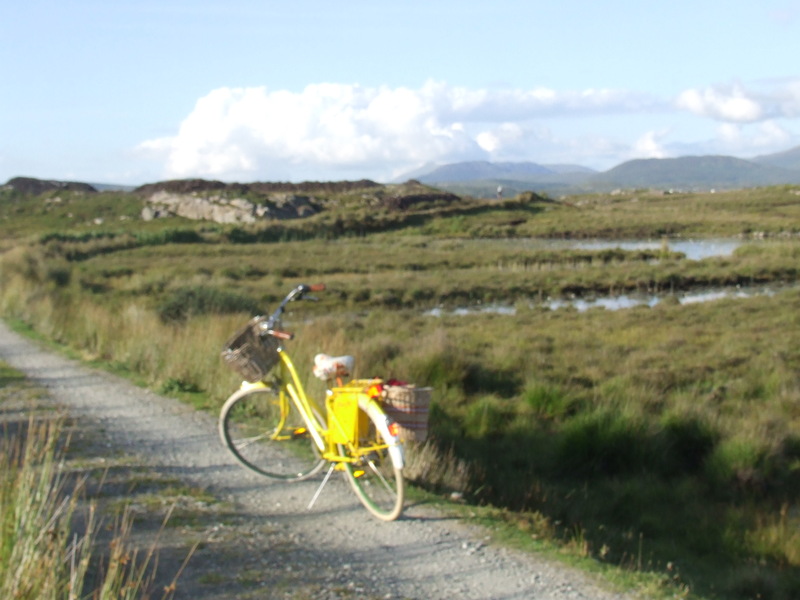 The wild atlantic way is big at the moment and is geared (pardon the pun) for cars rather than bicycles and walkers. Even its sign posts are designed to catch the eye of a driver and a fast one at that(as opposed to the simple shell of st james). All very romantic looking though I hope the jeep will fit under the height restriction barrier that delightfully furnish many of our beaches these days. Yet to see it by bicycle or foot or horseback is a far better way in my opinion. To be able to stop, pop off your bicycle and look at whatever view you choose, wherever you please as opposed to being imprisoned in a car where you have to hope you will find a pullin that is not already filled with other cars. And if it is, then, by the time you do find an empty spot and everyone in the car has agreed by general consensus that it is a worthwhile place to stop, that the view will not have been passed and the driver won’t say ‘ ah sure we’ve missed it ! we might as well keep going so’. Breath in the fresh atlantic air. Take heed of the scent of honeysuckle, wild dog rose and meadowsweet. Catch sight of small flocks of chaffinches and stone chats cheekily keeping you company as you cycle past red flowered fuchsia hedges before they disappear noisily over the brow of a hill. Watch peregrines soar high over mountains. Or gannets plunge kamikaze- like into the wild ocean. Smell turf smoke from nearby houses. See small dots of people footing turf on the bog. Paddle hot feet into clear rivers. Lean your bicycle against a cliff wall, look over and see a seals head far below breaking the surface. Notice also the shadows of basking sharks in the deep waters off the dingle peninsula. Watch a pod of dolphins as they chase a shoal of mackerel who in turn chase a shoal of herring fry. Camp overnight on some small patch by some deserted beach which you have found by exploring some small unsignposted lane apparently leading to nowhere. Watch the sun drop behind High island. All these things (If you are not knocked down by a large vehicle enroute that is). 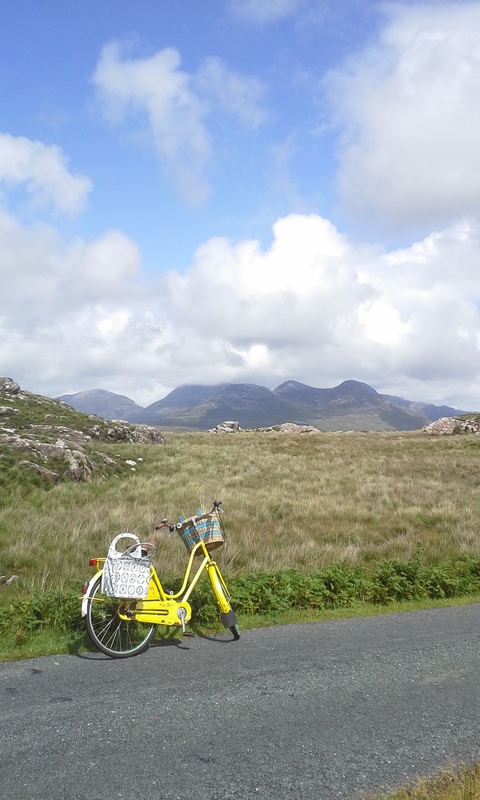 I have no wish to cycle the wild Atlantic way again. It has lost the appeal and magic it had forty years ago when I didn’t gather a mile tail back queue of cars waiting their chance to whizz past and nearly knock me into the ditch and fill my lungs with exhaust fumes. Instead I will focus on the hauling of my bicycle over bog ways and un-signposted way’s and down small grass-growing-in-the-center ways and if I want something civilized I will cycle the canal pathways and the greenways. And I will leave the wild atlantic way to the SUV’s and the cars and the touring buses. It’s the big difference between a bike and a car. I admit a car will give you the bigger picture and faster too. But I am more interested in paying attention to smaller things. I will continue to refuse to be told by large white and blue signposts which way to go. I will continue to go my own way complete with a bee in my bonnet. And the lack of a decided destination and the discovery of small un-signposted boreens will continue to suit me and the yellow bike just fine.